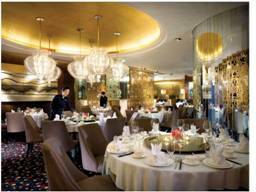 A short ferry ride from the hustle and bustle of Hong Kong and you will find yourself in Macau. Lying on the western side of the Pearl River Delta across from Hong Kong, Macau is a city with two distinct personalities. 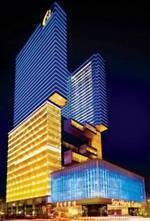 Heavily dependent on gambling and tourism, with over 30 casinos, Macau is often known as the Las Vegas of Asia, with its famous Casinos and gambling houses. 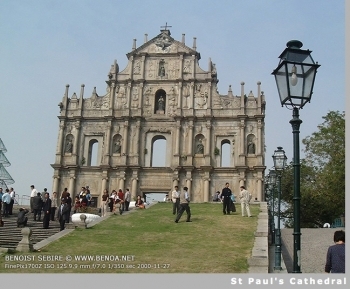 There is another side to Macau, of fortresses, churches and colonial influence. 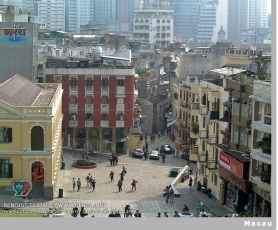 When visiting Macau, it is really important to see both sides to this city. The climate is warm and tropical with average temperatures about 20ºC (68ºF) and ranges from 16ºC (50ºF) to 25ºC (77ºF). and high humidity. The annual rainfall is 1.778mm, mostly during summer. 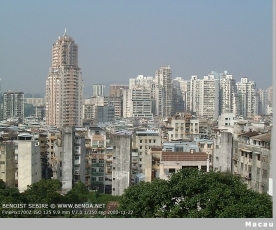 Macau is a very safe place for tourists with police stations and reporting centres throughout the territory. The emergency number is 999 and there are also two new 24 hour emergency hotline numbers 110 and 112 meant to facilitate emergency calls by tourists from the mainland and abroad. Taking off from the height of 233m of the Macau Tower the 20 second flight over the city is breathtaking. The sensation of flying through the air at 75km per hour will certainly get he adrenalin pumping. A spectacular lasar light fire show in a giant dome. 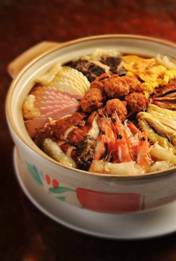 The story tells about the legend of the Jade Emperor and four ocean-dwelling dragons. This show is free and shown nightly at The City of Dreams Casino. Macau Tower Bungy JumpThe world's highest bungy jump has a free fall speed of up to 200km per hour plunging from a platform 233m high. Jumpers land safely into a specially designed airbag. On the 10th floor of the Golden Dragon Hotel, the Crazy Happy Show will bring out your wild streak. Male & femal dancers star in the full striptease show including sensual moves and athletic stunts. The stage is revolving and dancers can be seen hanging upside down from a pole and occassionally leaping onto table tops. Asian flair is incorporated in all the Star-grade amenities as well as in the ultra-high levels of personal service, appealing to both Asian and international tourists. Striking architecture and luxurious guest-room decor exemplify the outstanding level of quality provided by StarWorld Hotel and Casino. This attention to detail has gained StarWorld Macau recognition through numerous prestigious awards including the 5-Star Diamond award from the American Academy of Hospitality Sciences for 5 consecutive years and the Top 100 Hotels of China by the China Hotel Industry Summit. Famed for its “Star Rated” quality in hospitality, entertainment, accommodation and restaurants, StarWorld Macau is determined to offer its valued guests the prestige of “When I step into StarWorld Macau, I shine like a star”.